Is convenience the be-all and end-all when it comes to consumer decisions? Those arguing the vital importance of bike parking to retailers and business operators would have us believe that convenience is all that matters. But for ‘loyal and local customers’ there is more to life than car parking. The death of ‘bricks & mortar’ retailing? Some argue that the future of bricks and mortar retailing bleak, but others tell us there will always be a place for real shops with real people staffing them, because of what we are looking for in our shopping experience. If all that matters is convenience, then nothing beats the comfort of your own home and your own device as a way of getting shopping done. Online it is easy to browse, easy to compare, and you don’t even have to change out of your PJ’s and slippers. So why do we still shop at ‘real shops’? It’s about the experience, it’s about people, it’s about connecting and chatting and feeling like part of a community. So if you are selling convenience, give up now…. Your customers are going online and it is only a matter of time…. But if you are selling an experience then welcome to the future. And the future is about people focused transport. That means people walking, people taking public transport and people biking. Sure there is a place for drive-through convenience, or big box retailing. But when streets and shopping villages are being redesigned to be more people (and bike) friendly it is not about creating speed-in and speed-out destinations. It is better for business to create an environment where people want to linger, to meet, to chat, to browse. People friendly places have higher footfall and higher customer spend rates. Yes. Overseas experience shows that, despite initial fears, the value and popularity of people friendly streets goes up when traffic is reduced and the focus is on moving people not moving and parking cars. Traffic calmed areas and areas with cycle lanes have increased in value and are highly sought after by both residential and commercial investors and tenants. Their customers are loyal and local and seeking an experience as well as connection with their community. “Hardware store owner Steve Robson was once bitterly opposed to people-friendly improvements planned for the street outside his shop. He helped to raise a petition against the scheme, attended meetings to express his opposition and was in the local newspaper claiming the plans to remove parking places would be “devastating for businesses”. He is now a poster-child for “bikenomics”, the theory that making towns and cities more cycle-friendly is good for the local and national economies. He stars in a new Sustrans video promoting the charity’s Bike Life report, which is published today and which reveals 75 percent of Brits are in favour of installing protected cycleways throughout the country.” Source BikeBiz, Carlton Reid. Local shopping and being a ‘localvore’ are back in fashion. Increasingly people want to know more about what they are buying, and are favouring quality over quantity and value over price. The success of local businesses in unexpected locations, such as Zany Zeus in Moera are testiment to the pulling power of a great business and a unique selling point being key. It also helps that they are handy to the Rimutaka Cycle Trail! Retail areas that are thriving are the ones which create a place where people want to be. It is not about getting in and out as quickly as possible. Instead it is about having an attractive place to shop, eat and experience your local community, the arts and entertainment. Think about how popular Cuba St mall in Wellington is. Contrast that to the dead and dying high streets that prioritise traffic movement and car parking over space for people. Greg Harford, Retail NZ quoted in Bricks vs Clicks: Keeping NZ’s Heartland High Streets Healthy – a radio NZ insight documentary looking at the future of High Street retail in NZ. Auckland’s K’Rd has a bright future thanks to it’s new people focused street design: “New developments on K Rd, and transport improvements in the area, will bring in a bigger customer base which is positive for all occupiers on the street – both old and new.” Whilst preparing for the K’Rd development, surveys of retailers and shoppers found that people on foot, using buses or bikes spent much more than expected – an important lesson that it is easy to overestimate the importance of car parking to retail. Images from Auckland Transport of what is possible for K’Rd (above and side), and Pitt Street to Queen Street (below). 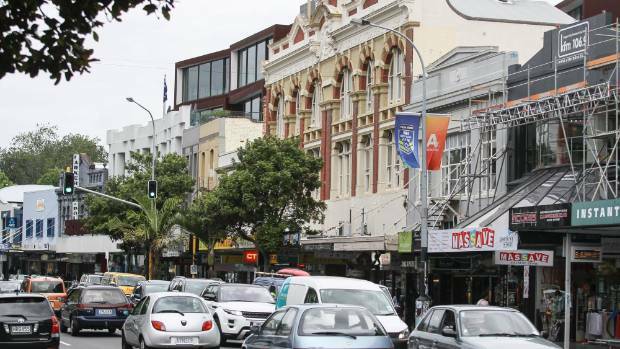 And an image of K’Rd today from stuff.co.nz. Bikes Welcome use friendly conversations to raise awareness that not all customers come by car. Customers walk, they use buses, trains and bikes. We encourage businesses to be bike friendly and let them know how that can benefit their business. Celebrating the great things that are happening in the region that encourage more people to cycle more often. Nominations close on March 13, with awards announced at a fun night, on Tuesday 27th March, Tickets and more information – Eventbrite – Love Cycling Awards. Nominate your favourite bike friend business and please nominate Bikes Welcome! For more information on the business benefits of biking check out these posts from our blog. What makes a bike friendly business? What makes a bike friendly business? Bikes Welcome asked exactly that question and found out what is important to customers who ride bikes. Watch our short film ‘Joyn the revolution – bikes mean business’ to glimpse the benefits of biking for your business, your city and the secret to happy baristas everywhere. What would happen if you got a number of businesses together and helped them become bike friendly? Find out about the benefits of bike friendly business districts. What do goldfish, fingernails and lightning have to do with the business benefits of bikes? What do bike parking and burgers have in common? In this context, it is marketing: what can we learn from big brands such as McDonalds when it comes to ‘selling’ everyday bike use? And how does bike parking help businesses and the uptake of bike use? Here's how to keep in touch.